While he was out at Adepticon in Chicago, m'learned friend Aaron did an interview for the splendid 40K Radio (oh, the fake DJ slogans that name conjures up in my mind!). Aaron sent me a link to it, which I share with you here, in case (he said) I had half an hour to spare and I wanted to find out how much he loved me. Bromantically, obviously. My name comes up a couple of times. Work continues apace on the Sabbat Worlds Anthology (at left). Let me tell you a bit about that. Because my schedule has been dinked a little by the sudden arrival of Captain Epilepsy and his fun-loving WarpStorm Commandos in the last six months, several projects have had to shift a little. Prospero Burns has been put back a bit, and that's affected Gaunt a tad. As a compensation, we've gone full steam ahead with a collection of stories set in the Sabbat Worlds, where the Gaunt books, Double Eagle and Titanicus all take place. An all-star team of writers, including Aaron, Sandy and Graham, have picked their own little corner of the Sabbat Worlds Crusade to write about. I've just finished work on a brand new Gaunt story for the collection, a veritable novella, called of their lives in the ruins of their cities. Graham's Apostles story (that's right, folks) is a total, total blast. Aaron's just posted a teaser of his on his blog (see link below), and if that doesn't make you put on your reinforced excitement trousers, I don't know what will. While I've got your attention... in terms of my FAQ's, none are more FA than 'who do I send stories too when I've written them. Behold the answer: a link to Black Library's submission guidelines, plus details of their 2010 Submission Window. Let me, if I may, give you one piece of advice: follow the guidelines! Do not submit if you are not following the guidelines! They are clear and simple! There is no excuse for not following them! I can't wait, mate, I really can't. And with news of Iron Star being included, I'm frothing at the frothy bits. 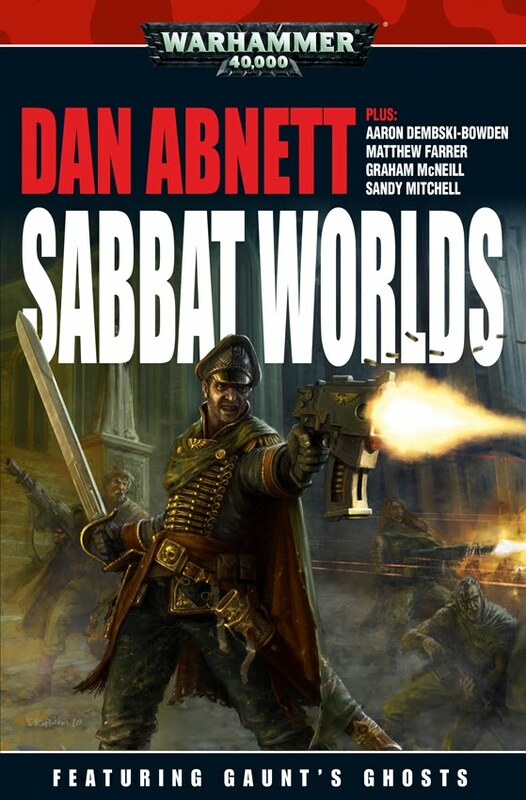 What I'm wondering is about Sabbats Worlds anthology, will be another follow up on the Ghosts adventures or will be like a conclussion about the liberation of Sabbats Worlds? Like this and this planet, maps, facts and stuff like that? How excitement reinforced are standard issue Guardsman trousers? As I can't find my own pair of extra reinforced excitement pants. Forkmaster - it's new stories set during the campaign, at different times during the whole event. It's not a round up set afterwards, nor is it a book with maps etc (we've done one of those, those it's REALLY hard to get your hands on it these days). There's news of Iron Star being included? If it is, I'm not sure I'm happy. I've got a copy of "The Sabbat Worlds Crusade" book signed by you! Hope you and Nik had a wonderful day and I'm thinking of you both mate. Despite everybody else’s excitement, I’m rather apprehensive about other author’s writing about hallowed Abnett territory. I’d rather wait as long as it takes for just Dan to write it when he’s feeling ok. Music fans have riots when other people step in for lead singers of bands! Although, I do I like Matt Farrer, his Calpurnia novels have some good plot pace. Yet I’ve never read anything by the new kid Aaron Dembski-Bowden, and I’m not a fan of Graham McNeil’s writing style. Basically Dan, I’m worried about what they’re going to do to your characters. tom - im asuming they wont be touching the ghosts and instead concentrating on other forces during the crusade i for one cant wait should help broaden out the crusade for those of us not lucky enough to have a copy of 'the sabbat worlds crusade'. I think I may have to confiscate your bucket of exclamation marks. Was going to give the submission a go. Though i'm not sure. Im a bit worried that the people who read it will say 'his writing style is too much like Abnett, Kyme, Parker etc'. Even if i am trying hard not to write in the same style as other authors with published works. Has anyone else had that feeling? I have been concerned. I think you have to put that ego to one side and just submit your stuff. You will naturally be influenced by what you're reading at that time and you'll write more like those authors. Submit anyway. At worst you hear nothing. At best you'll be invited to complete your stories and possibly get paid for them. Just for the record, I'm the only person writing Ghost characters. The merry band of talented writers joining me in this endeavor are going to be exploring people, places and things alluded to, or tangentially referenced, in my Sabbat tales. No one should be any more concerned about this than about the idea of multiple authors writing about the 40k universe as a whole. I'm flattered it's the 'Dan-i-verse'. In fact, to be brutally honest, if I had any worries about this at all, I'd have got BL to nix the idea along before we got this far. I love 40K radio, it's great. I don't watch the live feed but i wish the recorded show had the video footage, do you? Thats great news. But i hope your story in the anthology is about Salvation reach or something new - because i really hate flashbacks! Wow! I read your last installment in the serie - and i was devastated - its your fisrt book of G.G. serie there not a one G. die! Its so wrong. It makes me really angry and unhappy. Please dont make this mistake again! Dan, can you confirm for me either yay or nay as to whether the BL ever intend to print the green leatherette bound, limited edition version of Blood Pact that they've been very carefully tip toeing round for about the last 6 months. I've bought the other three in the series at the ridiculously inflated price that they asked and would very much like to complete the story arc in much the same way. I know you obviously don't have a hand in the printing yourself but it's becoming increasingly frustrating to be told, "perhaps", in as non de-script a fashion as possible when I know the real answer is probably no. Any strings you can pull perhaps, just to get a definite answer? I wouldn't normally ask but I would actually like to read Blood Pact at some point and I keep putting it off in case they finally release the version I want :-( It really would be most appreciated. This is Theshipissinking by the way. I've just managed to lock myself out of my account. AGAIN. Keep up the great work on the 40K Dan-i-verse. P.S. I also have a copy of The Sabbat Worlds Crusade book with a very nice head sketch loving scribbled by none other than the very talented Mr Karl Kopinski. No signature by you though. Something I shall have to remedy at the earliest opportunity. SFX Party with the stars! Crikey! AND some more! What a Friday this is! How Do You Do, New Doctor Who?